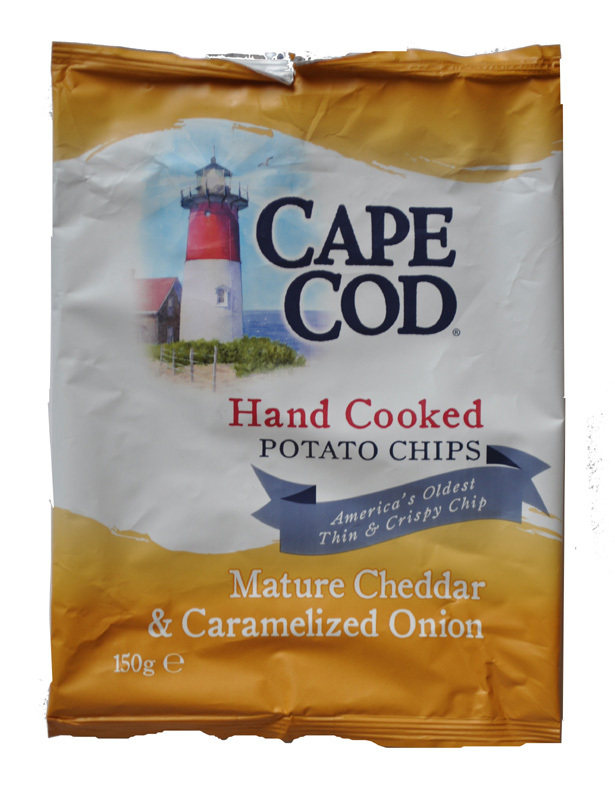 Hand Cooked Chips often feature splinter and crack in a hard and brittle fashion, but these crunched more like Regular Chips, which was perhaps confirmed by the front of bag claim that the contents were “America’s Oldest Thin & Crispy Chip”, whatever that means. These were not as irregularly shaped as some Kettle Cooked Chips. Neither did they feature a mass of oil boils and blisters. There was skin on edges and transparent oily areas of what were relatively plain looking Chips. A Nose Plunge Test revealed a mild Cheese aroma. There was definitely Cheesy and there was undoubtedly a background Onion flavouring. The ‘Caramelized’ claim was a little spurious for our taste, but it did combine with the Cheese, which again was little like Mature Cheddar, to form a fairly unique and original variant of the theme.